Eagle Ray 8’6″ x 17’ x 4’6” Contact us to get more information on this pool. Sunfish 8’ x 20’ x 4’6” Contact us to get more information on this pool. Key West 10′ x 20′ x 4’6″ Contact us to get more information on this pool. Sundial 13′ x 20′ x 4’11” Contact us to get more information on this pool. Stingray I 8’6” x 26’ x 4’6” Contact us to get more information on this pool. Stingray II 10′ x 26′ x 4’6″ Contact us to get more information on this pool. Stingray III 12’ x 26’ x 4’6” Contact us to get more information on this pool. Bahamas 10 x 24 Contact us to get more information on this pool. Cancun 12 x 25 Contact us to get more information on this pool. Beach Cove 12′ x 30′ x 4’6″ Contact us to get more information on this pool. North Beach 12′ x 31′ Contact us to get more information on this pool. Lap Diamond 12′ x 38′ x 4’6″ Contact us to get more information on this pool. Acapulco 12’6″ x 29’ x 5’10” Contact us to get more information on this pool. Tiger Shark 13′ x 31′ x 5’10” Contact us to get more information on this pool. Angelfish 13’ x 31’ x 5’8” Contact us to get more information on this pool. Waikiki 14’ x 30’ x 5’4” Contact us to get more information on this pool. Palm Beach 14′ x 31′ x 6’4″ Contact us to get more information on this pool. Sun Beach 14′ x 31′ x 6’4″ Contact us to get more information on this pool. Oasis I 13’ x 33’ x 6’2” Contact us to get more information on this pool. Oasis II 15’6” x 36’ x 6’5” Contact us to get more information on this pool. Costa Rica 15’ x 34’ x 6’ Contact us to get more information on this pool. Azures I 13’ x 35’ x 4’ Contact us to get more information on this pool. Azures II 13′ x 35′ x 6′ Contact us to get more information on this pool. Maui 15’ x 34’ x 6’6” Contact us to get more information on this pool. Honolulu I 15′ x 35′ x 4′ Contact us to get more information on this pool. Honolulu II 15’ x 35’ x 6’ Contact us to get more information on this pool. Island Beach 15’6″ x 37′ x 6’4″ Contact us to get more information on this pool. Dolphin I 16′ x 38′ x 6’6″ Contact us to get more information on this pool. Orca Jr 16′ x 40′ x 6’3″ Contact us to get more information on this pool. Orca 16′ x 44′ x 8′ Contact us to get more information on this pool. SPAS – Inground hot tubs are a great addition to your pool. Choose either a tub that spills over into the pool or a stand alone tub. Fiberglass Pools have no vinyl liner to replace – EVER! Average cost to replace a vinyl liner –$2950.00. Most customers will need to replace the liner TWICE in the time they own their pool. That’s almost $6000.00 for liners! Fiberglass Pools stay cleaner and require less vacuuming time. Maintenance is reduced by 90% due to the non-porous finish of fiberglass. More fun – less work! Fiberglass Pools use 60% less chemicals because the non-porous interior does not harbor bacteria and permit algae growth as does a vinyl liner pool. Fiberglass Pools use less electricity because you do not have to run your filter 24 hrs. per day. Fiberglass Pools stay 12% warmer because of the bright interior finish, stone Dust base under the pool, and the stone Dust backfill which holds the heat in the pool. Save money on heating costs!!! Fiberglass Pools don’t leak!! Pool is factory molded in one piece. No joints, no seams, no gaskets, no calking — no liner! Fiberglass Pools last longer!! They are 17 times stronger than concrete, can flex up to 1 ft without a fracture and are virtually bullet proof. Plus they can’t rot or corrode, don’t depreciate and if you ever move – take it with you! It’s as easy as 1, 2, 3…..You can be swimming in as little as 10 days! 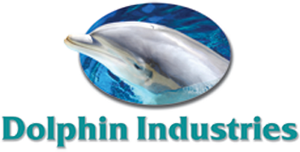 Dolphin Industries offers the highest quality fibreglass swimming pools for sale in NJ. Browse our extensive selection of models, color options and online images (with dimensions) to get excited about your new backyard oasis.